Palatial Santry House, adjoining the village of Santry, just north of Dublin, was originally the seat of the Barry family in southern Ireland. In the mid 18th century, thanks to the black sheep of the Barry family (son of Bridget, nee Domvile), the Lordship of Santry and the House passed to Sir Compton Domville, Bart., (1696-1768). One account of the monument to the horse says that ‘Sir Compton Domvile got in a rage with one of his best horses and ordered it to be shot. He rode away to Dublin, but changed his mind and got back just as his order was carried out. He erected this monument in memory of the horse.’ Another account says that for some reason his favourite horse threw him, ‘whereupon he went into the house and returned with a gun and shot it. Later, filled with remorse, he had the monument erected’. Santry is now a suburb on the north side of Dublin, just south of Dublin airport. There's a road there called Dunville Avenue. 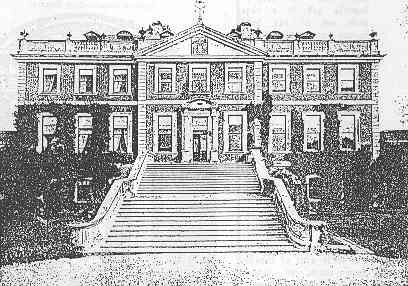 The mansion of Santry was used as a base for the Irish army in the 1940 emergency and was accidentally burned down in about 1943. In 1976 E J McAuliffe, Dublin genealogist, visited the area and described what he saw in a letter of 13 May 1976 to Martin Dunville of Florida, USA. The old village of Santry had gone and all that remained was an old house, bar, shop, and the old church. ‘The wall surrounds the demesne - now grazed by cows - and many fine old trees of an exotic kind remain. The old gate lodge is there but empty, and a new small house appeared near it. After braving the notice 'beware guard dogs' I opened the gate, and went to the house, where I met a young lady and told her I was making enquiries for a descendant of the Domvilles. She became immediately most friendly, and told me her name is Mrs Harris, and that she had known an old lady, now deceased, who worked for the Domvilles, who were good landlords, well beloved, and who did much for Santry. Alas, only a few old walls are all that remain of the house, and the monument to the horse has fallen.